America's Most Popular R/C Trainer - Now with Electric or Glow Power! The SIG KADET LT-40 EG ARF follows the long tradition of the Kadet R/C trainer airplanes. It maintains the signature Kadet stability which automatically corrects itself when the controls are released - a simply invaluable feature on a trainer plane. You won't find another trainer that can fly slower due to its large size and light wing loading features. The slow speed capabilities allow beginner pilots more time to think, to react, and to understand what the airplane is doing. This speeds up the learning process and gets new pilots flying like a pro in no time. What is new with the KADET LT-40 EG is it is a KADET that is redesigned to accept either electric or glow power. No matter what your power preference, you can still learn to fly with a KADET. NO FOAM! The SIG KADET LT-40 features authentic balsa wood construction, making it lighter, stronger, and more durable than other popular trainers. It is meticulously covered with UltraCote® premium polyester material. The KADET LT-40 is designed for fast assembly with a minimum number of parts, and the detailed photo-illustrated SIG instruction manual guides you easily through each step. A SIG spinner, Kavan wheels, SIG Easy-Hinges, pushrods, engine mounts, and Du-Bro fuel tank are all included hardware. 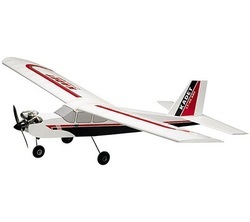 You will thank yourself for the opportunity to learn to fly RC with a KADET LT-40!